The success of OROGOLD rests on 3 important principles. The combination of these 3 principles is what drives the culture at OROGOLD. The luxurious experience is felt in all our locations down to every detail. Even the décor has a plush feeling from the tufted walls to the comfortable chairs to the Midas kissed details. OROGOLD is your answer to youthful and radiant skin. Here at OROGOLD we strive to provide not only the tools to nurture your skin but also an environment where you feel comfortable doing so. Our trained staff is ready to provide personalized beauty recommendations as well as relaxing facials. Most importantly OROGOLD products are formulated with the highest quality ingredients including our signature ingredient, Gold. The cutting-edge combination of Gold and other potent ingredients, including Vitamins, Peptides and Hydroxy Acids, work together to peel away the years. For more information regarding the ingredients visit orogoldingredients.com OROGOLD offers 15 different collections to suit various skin types and issues. OROGOLD came to life to give consumers access best quality skin care cosmetics. In the years since the company’s birth it has grown from location in just a couple of states in the United States to a worldwide phenomenon. 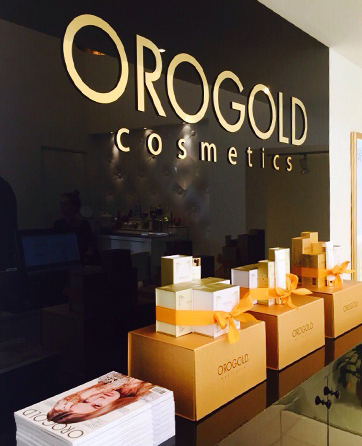 OROGOLD is headquartered in Los Angeles with stores and offices in over 20 countries around the globe.